Painted Hall dressed for Chatsworth House Style. 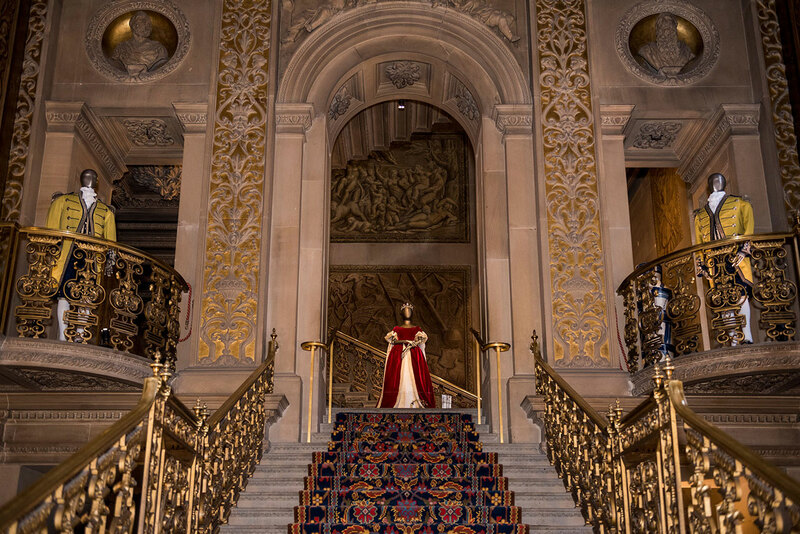 Photo courtesy Chatsworth House Trust. 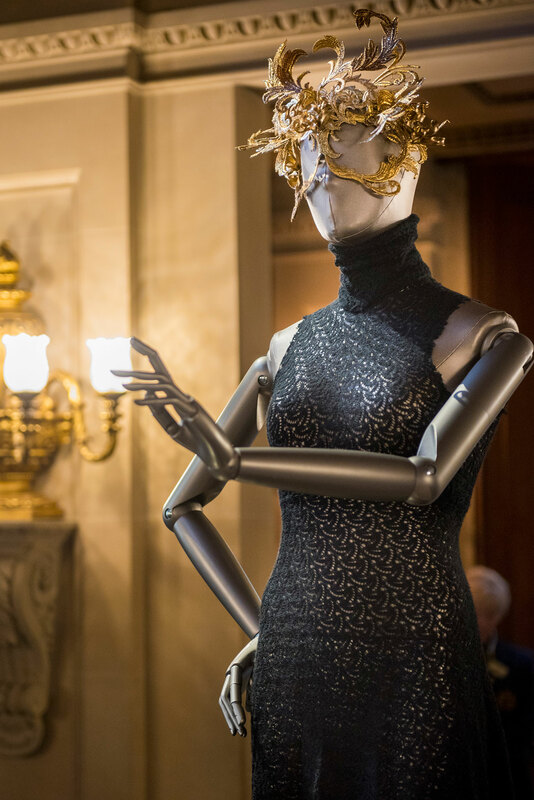 Glamour, elegance and historical significance are all on display at House Style: Five Centuries of Fashion at Chatsworth, an elaborate exhibition which is gracing the storied halls and gilded ballrooms of Chatsworth House, until October the 22nd, 2017. 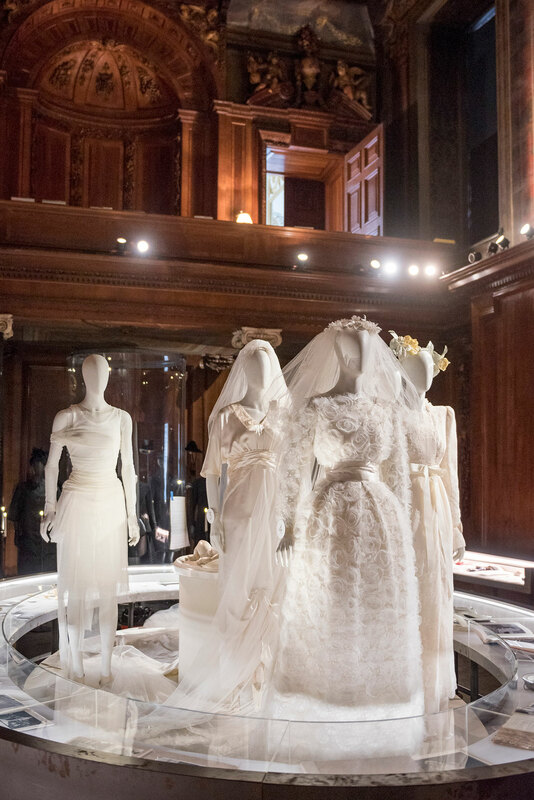 Curated by American Vogue magazine's International Editor-at-Large Hamish Bowles, under the creative direction and design by Patrick Kinmonth and Antonio Monfreda, the exhibition was first conceived six years ago when Laura Cavendish, Countess of Burlington, was searching the house's vast archives for a christening gown for her son, James. 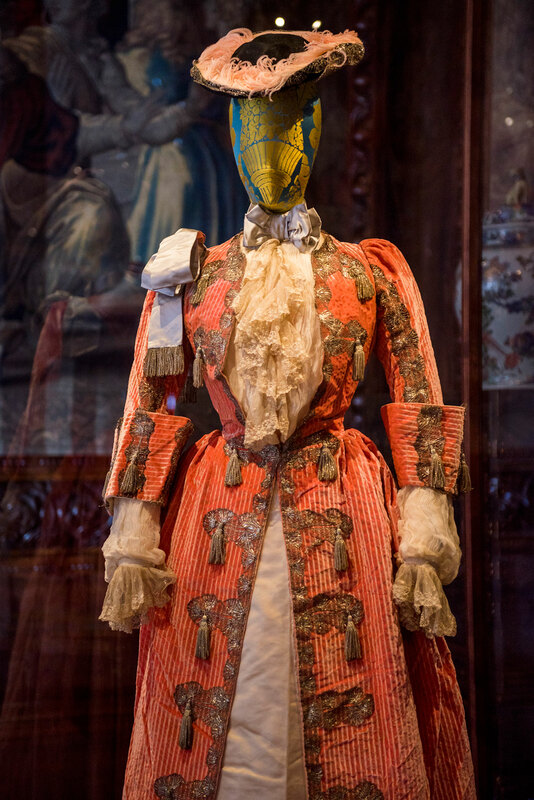 With the Duke and Duchess' of Devonshire consent, she asked Mr. Bowles to take a look and they all agreed that the magnificence of the clothing and textiles in storage was too splendid to not be put on display. Rizzoli publishing house agreed too and has published a book by the same title documenting this collaboration which is available from the Stables and Orangery shops at Chatsworth. 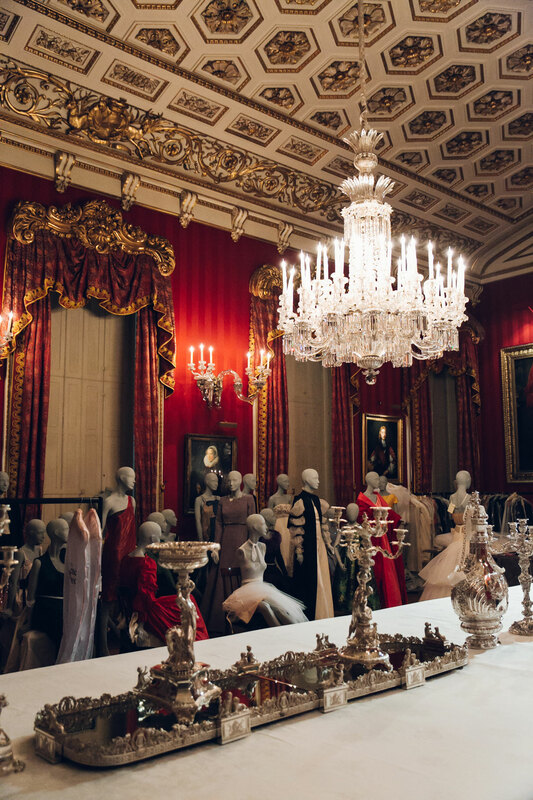 Located in the heart of Britain's beautiful Derbyshire Peak District National Park, Chatsworth House - one of the ten Treasure Houses of England - harkens back to a time when grandeur was an everyday occurrence, when ladies and gents dressed in couture for supper and adorned themselves with diamonds and tiaras on the weekends. And it is this lifestyle that is presented through the fashion retrospective, revealing the clothes and accoutrements of some of the inimitable "characters" that has lived and graced Chatsworth House, such as Duchess Georgiana, Duchess Deborah (one of the famed Mitford sisters), Adele Astaire, Kathleen "Kick" Kennedy and Stella Tennant (Duchess Deborah's granddaughter) among others. 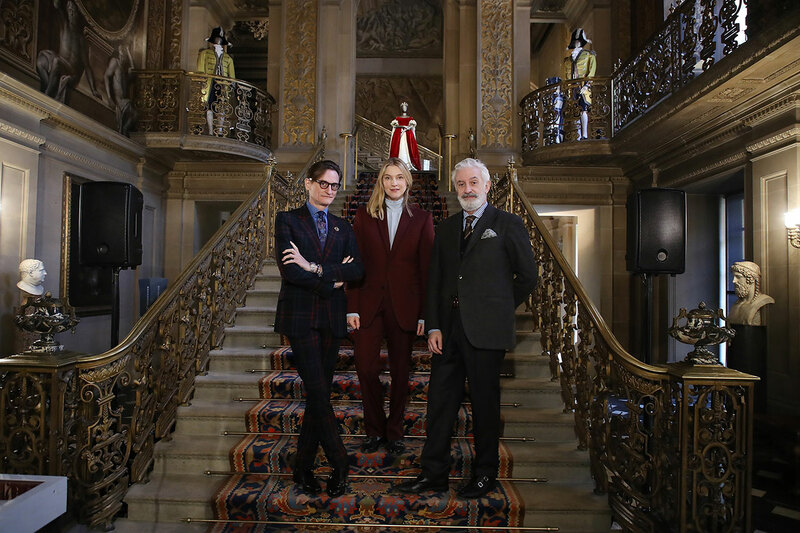 Hamish Bowles, Laura Burlington & Patrick Kinmonth. Photo © GUCCI. 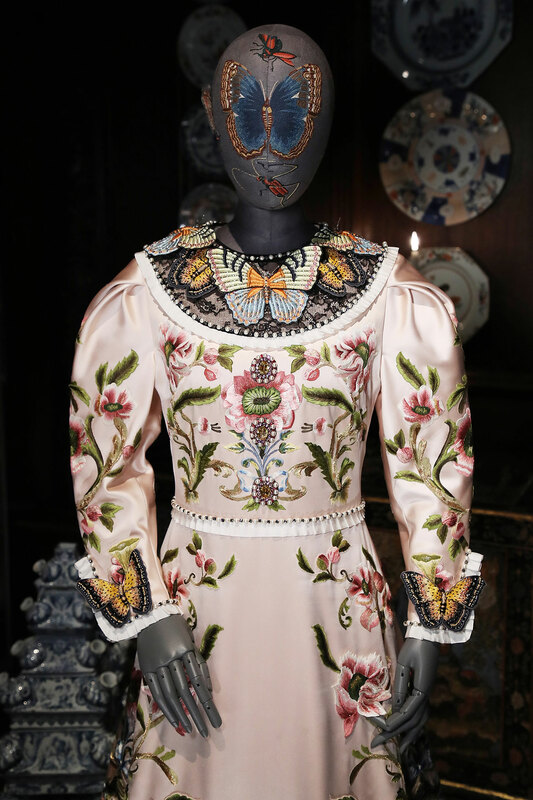 A Gucci dress created by Alessandro Michele for the Duchess of Devonshire. Photo © GUCCI. 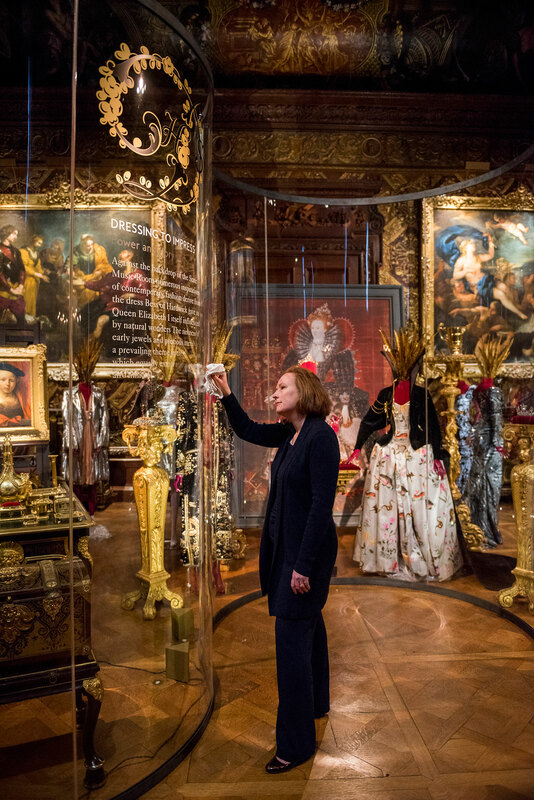 Chatsworth's head of textiles Susie Stokoe in South Sketch Gallery. 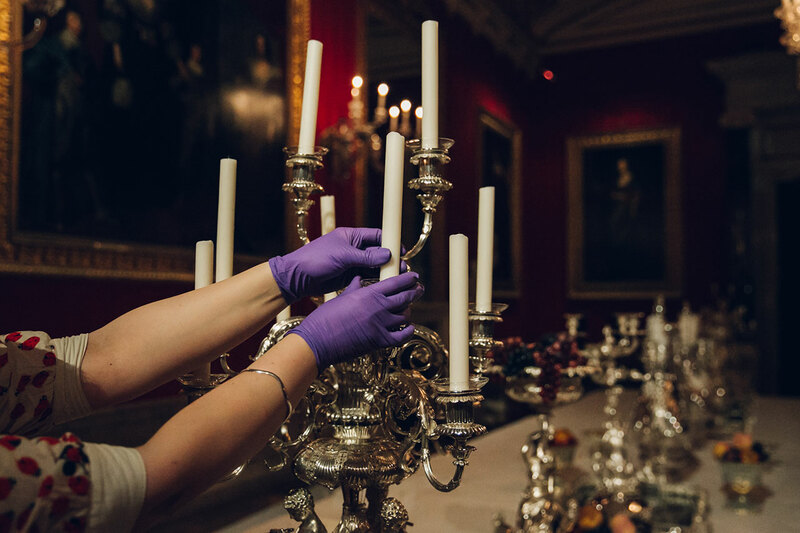 Photo courtesy Chatsworth House Trust. 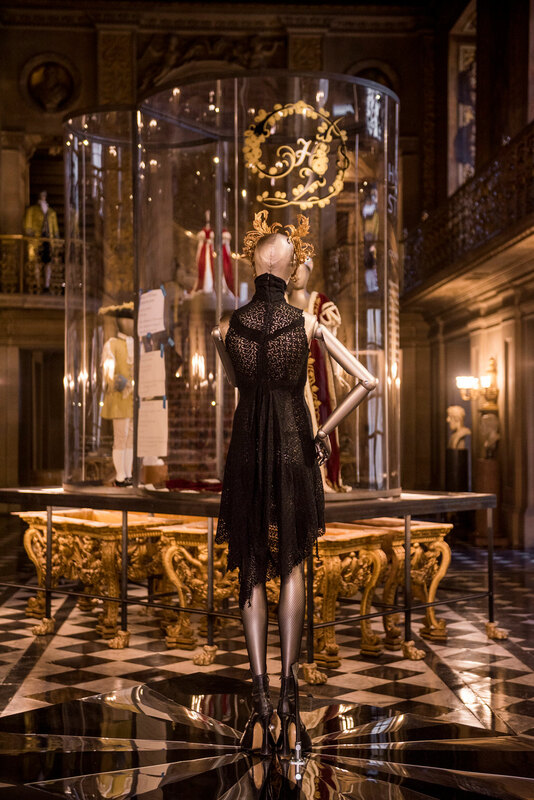 Alexander McQueen dress worn loaned by Stella Tennant, model and the Duke's niece to Chatsworth House Style. 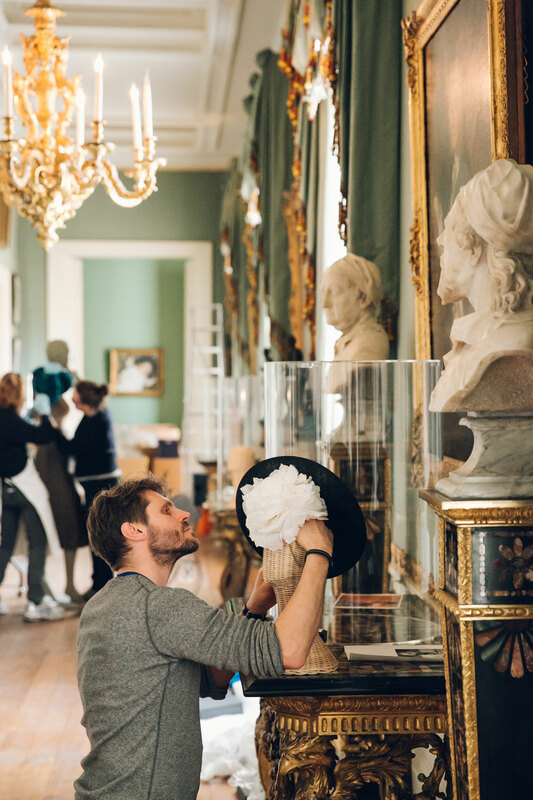 Photo courtesy Chatsworth House Trust. The exhibition - which is sponsored by GUCCI, together with C W Sellors Fine Jewelry, Investec, Sotheby's and Wedgwood - starts in the crystal chandelier bedecked Chapel Corridor with a fashion-based timeline which spans the carpet of its gilded length featuring over a hundred fashion items and accessories, such as gold headdresses and even Duchess Georgiana's gold brooch. 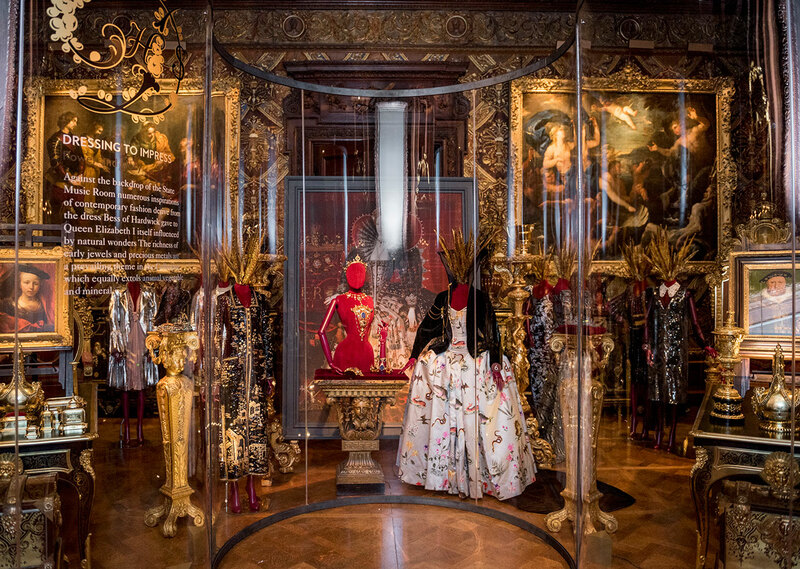 Meanwhile, in the decadent mural clad Painted Hall, garments such as a red velvet with ermine trim Coronation Gown from 1937, as well as Stella Tennant's Helmut Lang silk wedding dress from 1999, leave visitors in awe with their respective, incredible detailing and "wow" factors. 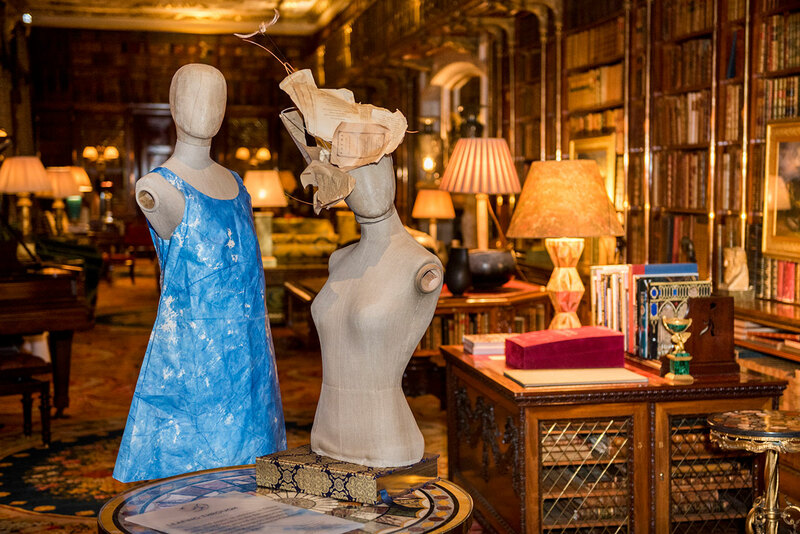 Dress by Hussein Chalayan courtesy of Stella Tennant and Stephen Jones hat shown in the library. 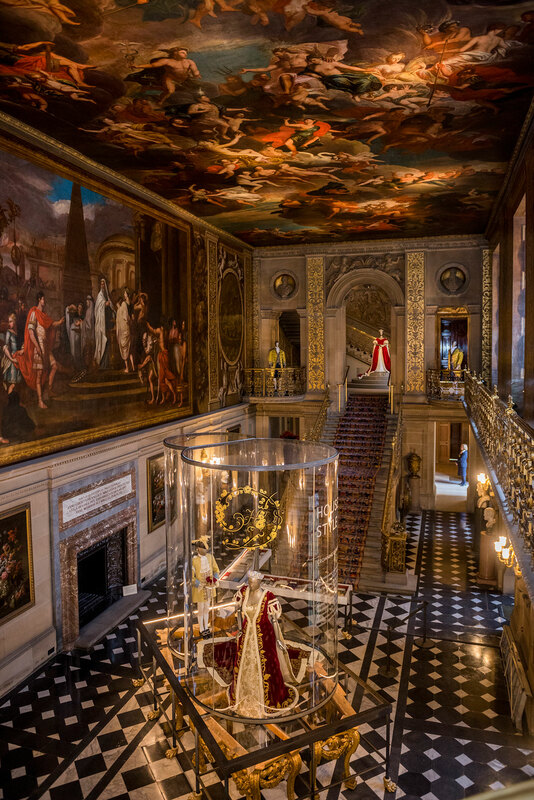 Photo courtesy Chatsworth House Trust. 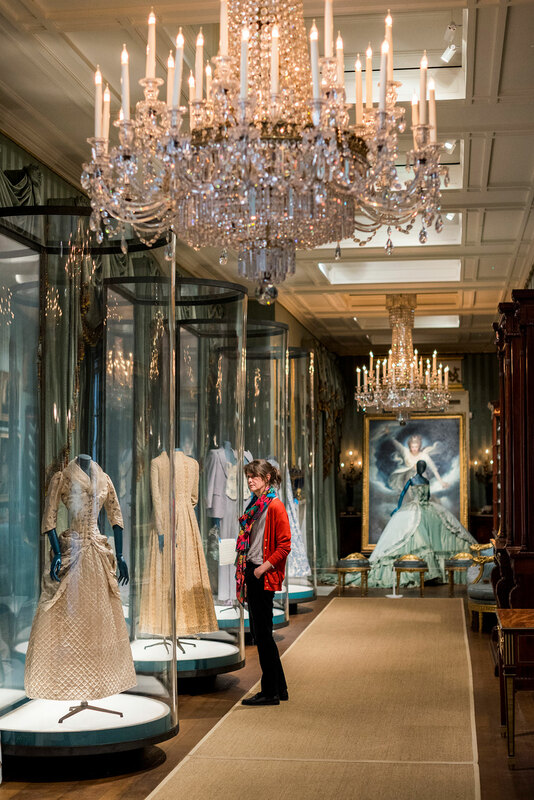 Dresses on display in State Music Room. Photo courtesy Chatsworth House Trust. Dressing to Impress, State Music Room. 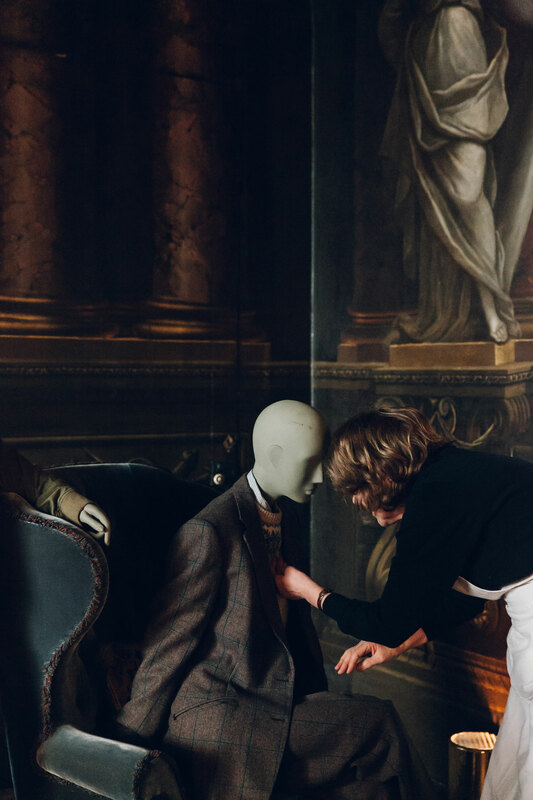 Photo courtesy Chatsworth House Trust. Chatsworth's Justine Kouparri at the opening of House Style. Photo courtesy Chatsworth House Trust. 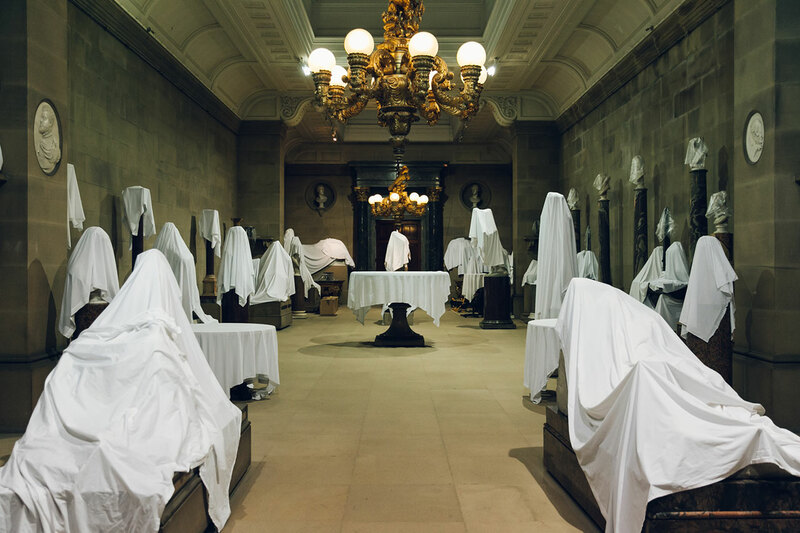 But perhaps the most jaw-dropping destination in the house is the improbable party taking place in the Great Dining Room. 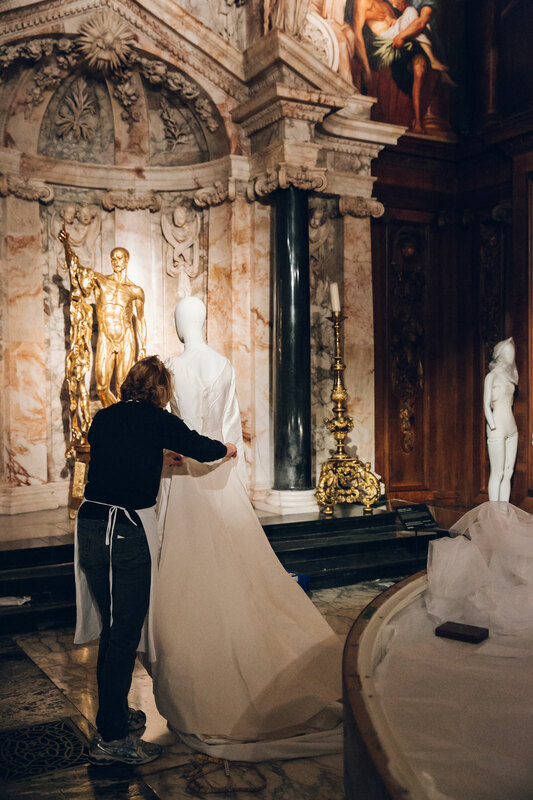 In here, enveloped by the red silk lined walls and coffered ceilings dripping with gilding and crystal chandeliers, over thirty mannequins are bedecked in a host of couture gowns created by every designer imaginable - from Chanel and Balmain, to Tom Ford and Dior. 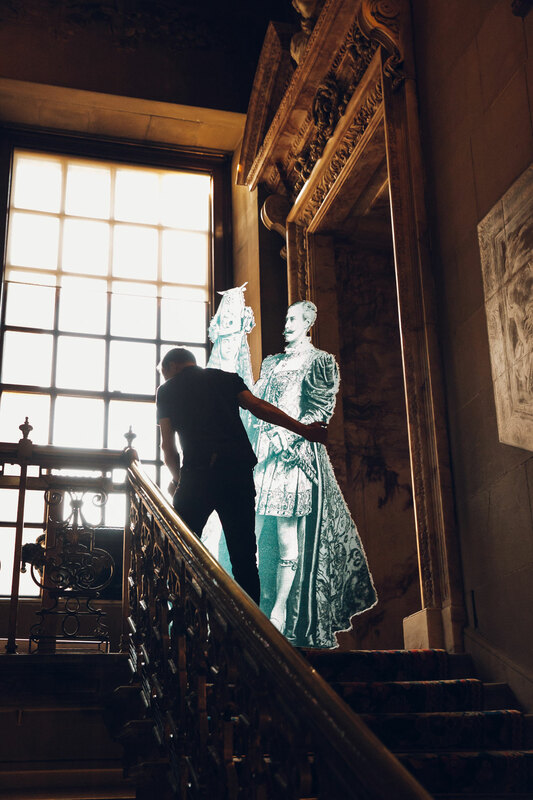 Visitors to Chatsworth House are invited to take part in the celebrations - despite their probably less-than-splendid modern touristic mode of dress - and touch upon the splendour of the grand house's history that for a brief moment coexists with the present in a way that not only inspires and enthuses but also reminds us that beauty, attention to detail and quality workmanship are never a thing of yesteryear, but a necessity in each moment. 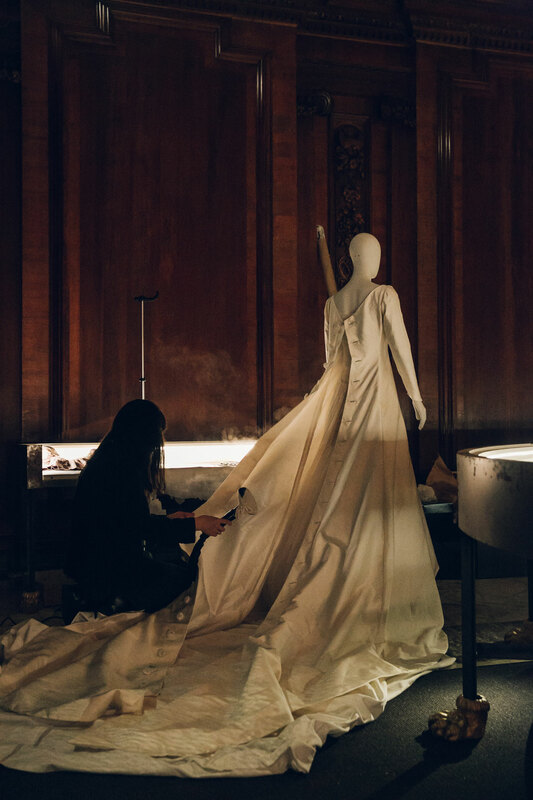 Dress by Alexander McQueen worn by the Duke's niece Stella Tennant on her modelling debut. 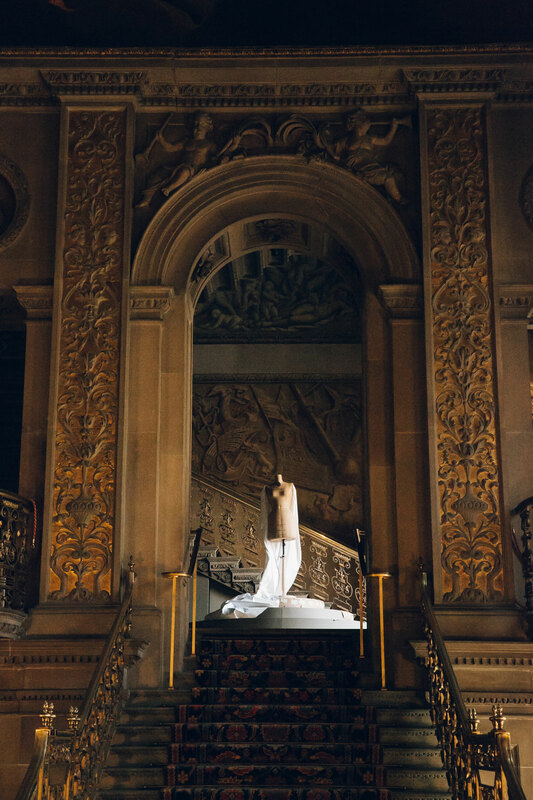 Photo courtesy Chatsworth House Trust. Duke and Duchess of Devonshire with Mistress of the Robes gown worn by Deborah Devonshire for Elizabeth 11 Coronation. Photo courtesy Chatsworth House Trust. Deborah Devonshire Mistress of the Robes. Photo courtesy Chatsworth House Trust. 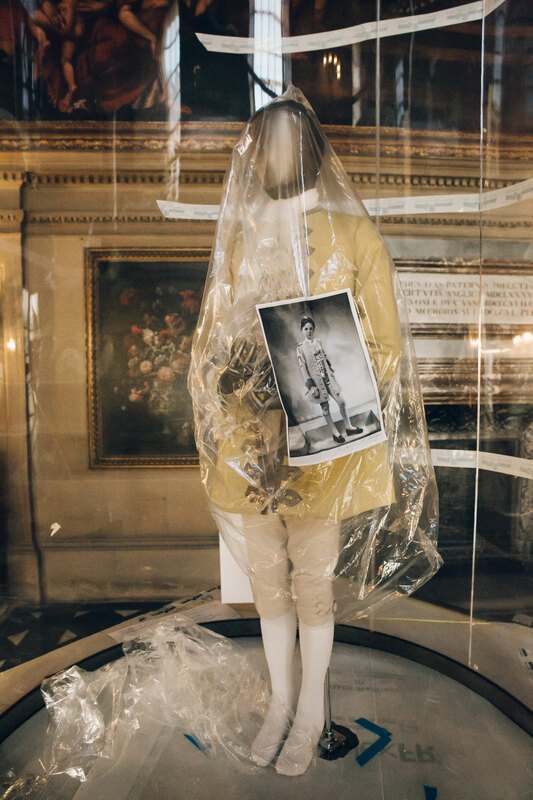 Coronation Robe in the Painted Hall at Chatsworth House Style. Photo courtesy Chatsworth House Trust. 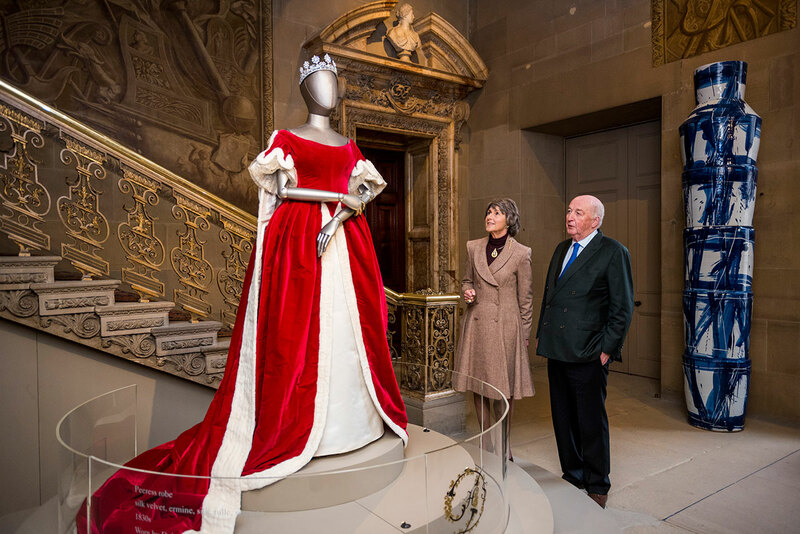 Deborah Devonshire's dress worn for Elizabeth 11 coronation shown at top of stairs in the Painted Hall. Photo courtesy Chatsworth House Trust. 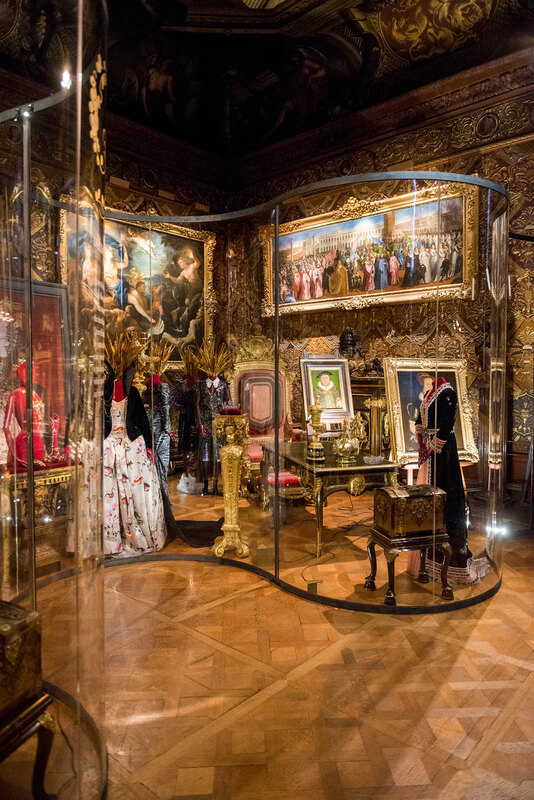 The exhibition reminds us that beauty, attention to detail and quality workmanship are never a thing of yesteryear. Painted Hall, Chatsworth. Photo courtesy Chatsworth House Trust. 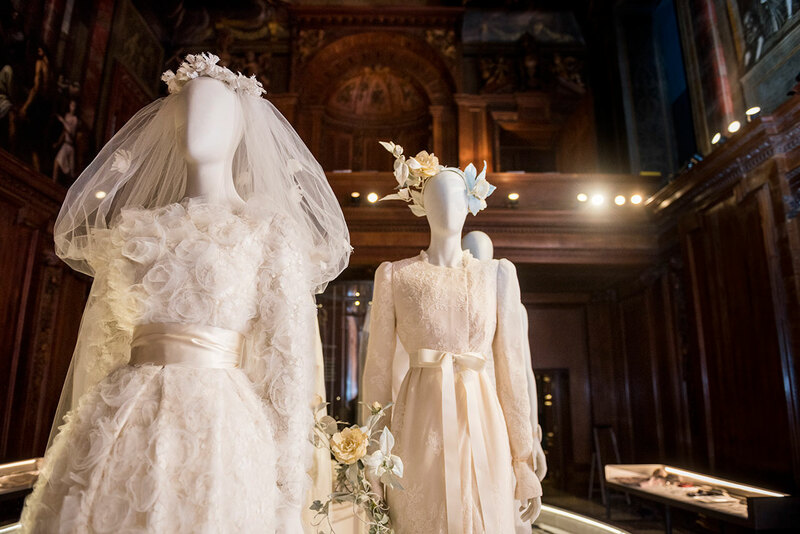 Wedding dresses of the family in the Chapel, part of the Circle of Life display. Photo courtesy Chatsworth House Trust. 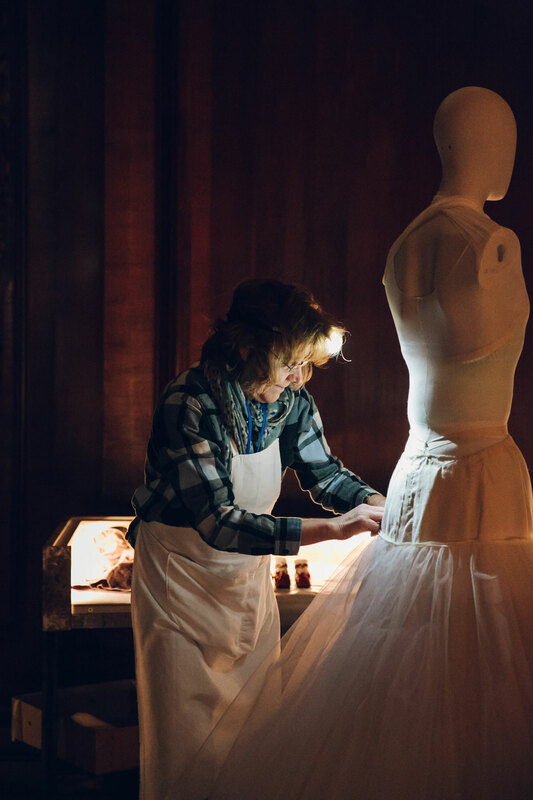 The making of "House Style: Five Centuries of Fashion at Chatsworth" exhibition. ​Photo © Chatsworth House Trust. Family wedding dresses in the Chapel. Photo courtesy Chatsworth House Trust. Dressing for Dinner in the Great Dining Room. Photo courtesy Chatsworth House Trust. 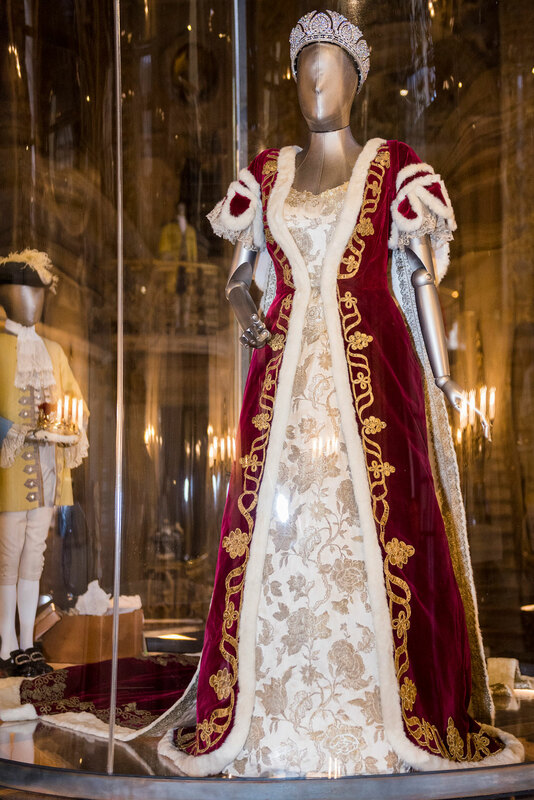 Duchess Louise's Worth dress from the Devonshire House Ball, one of more than 100 dresses spanning 500 years of history at Chatsworth House Style. Photo courtesy Chatsworth House Trust. 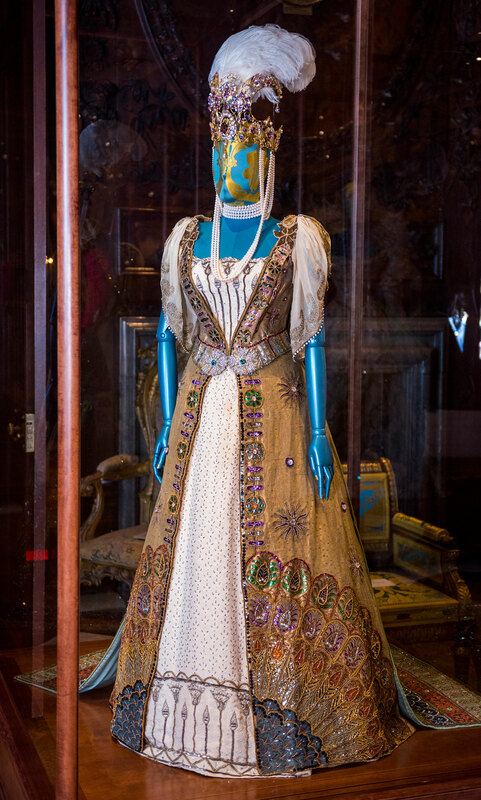 Lady Isobel Stanley’s costume for the 1897 Devonshire House Ball by Jean-Philippe Worth for the House of Worth. Photo courtesy Chatsworth House Trust. 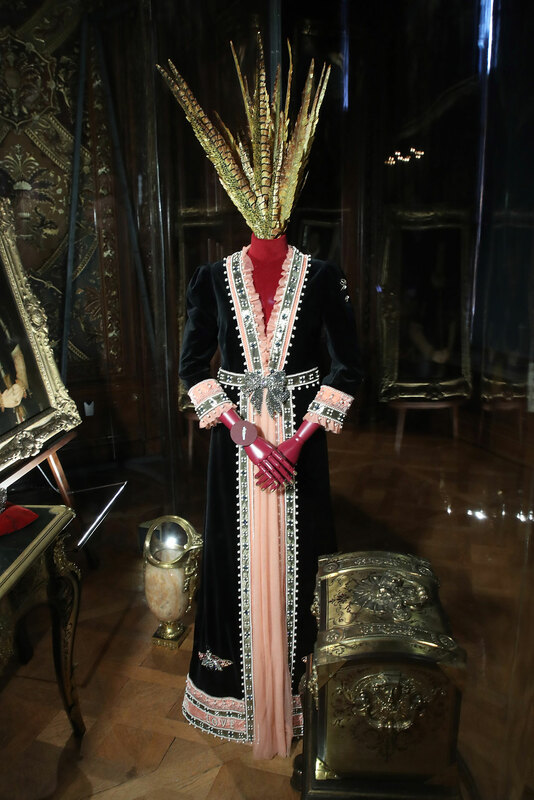 A Gucci dress created by Alessandro Michele for Lady Burlington. Photo © Chatsworth House Trust.